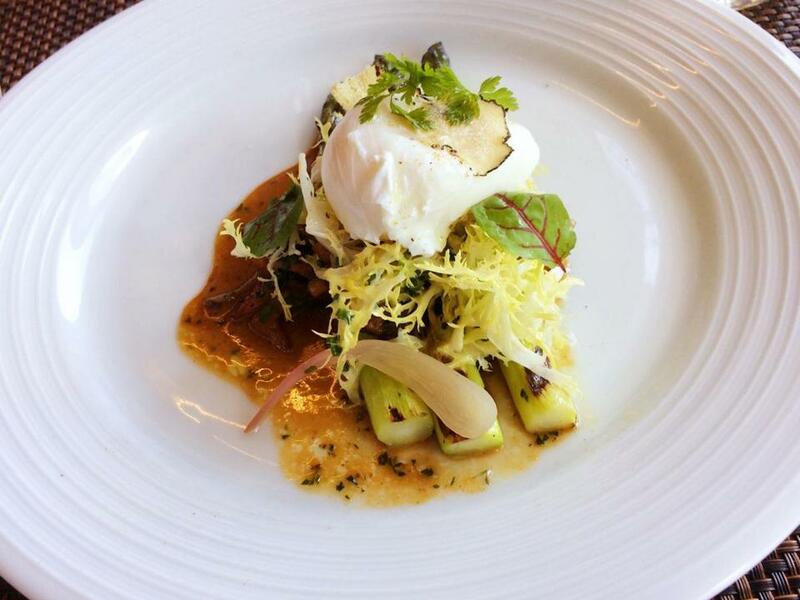 The warm asparagus salad at the farm-to-table restaurant Arethusa al Tavolo features a soft-poached egg from Arethusa Farm, along with pickled ramps, English peas, and foraged mushrooms. BANTAM, Conn. — On a sunny summer afternoon in this sleepy, leafy town, all roads lead to Arethusa Farm Dairy. In front of a red brick building that used to be the town firehouse, dozens of people are standing, sitting on benches, or perched on a low wall. There are families and children, teenagers and seniors, even heavily tattooed bikers, but they all have one thing in common: They’re all eating ice cream. 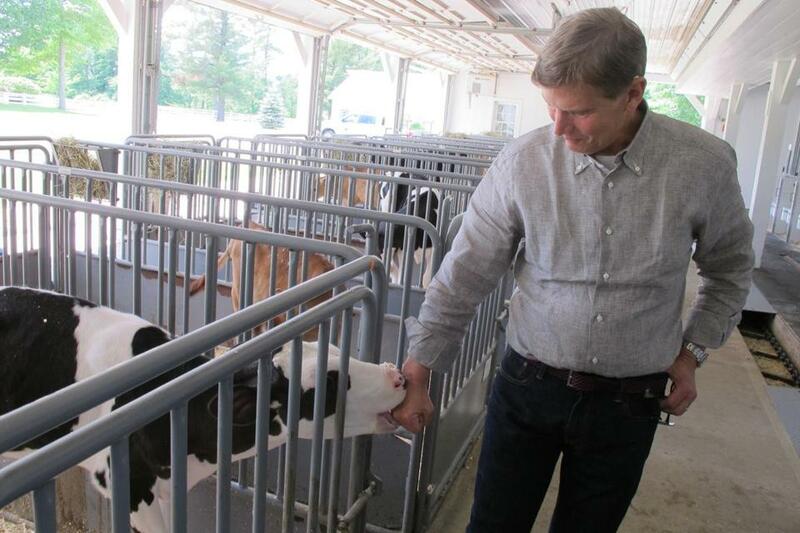 The dairy is the main production and retail outlet for Arethusa Farm in nearby Litchfield, which has grown in just over a decade from a 16-cow operation producing milk to a 400-cow enterprise producing milk, ice cream, yogurt, and cheese. Along the way, owners George Malkemus and Tony Yurgaitis have opened a farm-to-table restaurant in a historical building next to the dairy, a bakery and café across the street, and a retail dairy store across from the Yale University campus in New Haven. How did they get here? It’s a story even they seem to find surprising. In 1999 the pair bought the land across the street from their Litchfield home to save it from being turned into a golf course. It had a history as a dairy farm and was named “Arethusa” after a rare orchid that grew on the property. They built a milking barn for 16 cows just to keep the property a farm and sold the milk to coops. But the milk, said Yurgaitis, who grew up in Waterbury, Conn., was very good. “When I tasted it,” he recalled, “I thought, ‘This tastes like the milk I used to drink.’ ” Why, they asked themselves, were they giving it to other sellers? They decided to bottle it and see if the market would embrace their label. Tony Yurgaitis, one of the owners of Arethusa Farm, said his late-in-life development as a dairy farmer was "like discovering something dormant, something in your life that doesn't manifest itself until later." Recognizing that it all starts with the cows, the would-be farmers began attending livestock shows, learning about bloodlines, and building a high-quality herd. But that process can take up to five generations, Malkemus said. What they could do right away was create the best possible conditions for their current herd. “We are conscious of every aspect of what happens to these cattle,” he said. Cows are washed d aily, and their tails are conditioned with Pantene Pro-V and blow dried. They get regular foot baths. The barns are astonishingly clean. While giving us a tour of the farm, Yurgaitis noticed a bit of you-know-what on one cow’s udder. Without pausing in his narration, he grabbed a paper towel from a dispenser, gently wiped away the offending element, washed his hands, and continued the tour. 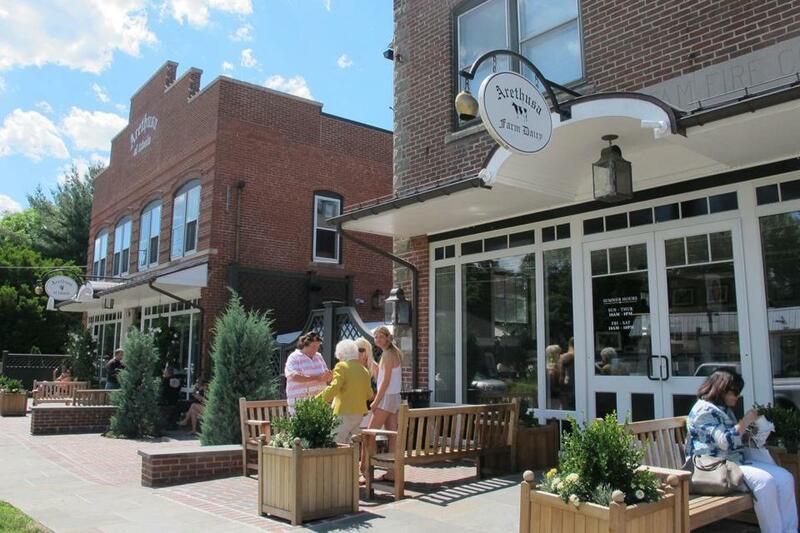 Arethusa Farm's creamery is in the old firehouse in Bantam, and the building next door houses the farm's Al Tavolo restaurant. The affection Yurgaitis has for the cows is evident. He smiles at them, calls them by name, offers a hand to nuzzle or lick. While he insists he never nurtured a secret yearning to be a farmer, he admits he’s enjoying the role. “It’s like something dormant, something in your life that doesn’t manifest itself until later,” he said. It was a quick trip from milk to ice cream, and the success of the ice cream encouraged them to branch out. It took two years to perfect butter, Yurgaitis said, and then they tackled cheese. Using technology from France, they built a cheese aging facility at the dairy, then sought training with local cheese makers. Today Arethusa makes about six cheeses — including farmers, blue, Swiss-style, Camembert, and washed-rind varieties — and Yurgaitis believes they can hold their own against any European cheese. At Arethusa al Tavolo, the farm-to-table restaurant they opened in 2013 next to the dairy, there are fresh flowers on the tables and ceramic pasta plates Malkemus picked out in Puglia, Italy, on the walls. The high ceiling in this historic building is original tin, and there’s a brick patio ringed with flowering plants and edged with a bucolic scene of cows grazing on a hillside. Menus feature dairy products from Arethusa as well as fresh ingredients from other local farms. The restaurant was listed in Open Table’s top 100 restaurants in America in 2015. “We thought we’d have a wine and cheese restaurant, then it expanded,” noted Yurgaitis with typical understatement. In April of this year Arethusa a Mano, a bakery and café featuring New York-style bagels, opened across the street and sold 1,000 bagels the first weekend, according to Malkemus. Arethusa Farm (arethusafarm.com) in Litchfield welcomes visitors Saturdays 12:30-2:30 p.m. The dairy in Bantam is open daily 10 a.m.-8 p.m. For restaurant reservations, visit arethusaaltavolo.com. 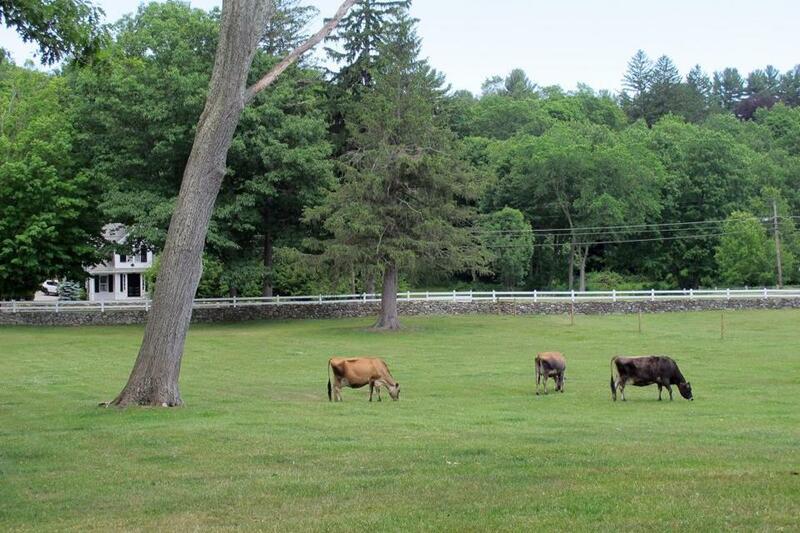 At Arethusa Farm, cows that are past their milking prime spend their days in the fields.